Henoch Schonlein Purpura (HSP) is a condition which causes inflammation of the small blood vessels in the body. The swollen and irritated condition of these blood vessels is also known as vasculitis. HSP predominantly affects the blood vessels of the skin, gut/intestines and the kidneys. When the blood vessels are inflamed, they bleed and cause the typical rash seen on the skin. HSP is an immune mediated condition in which the body’s own immune system causes damage to its own blood vessels. The exact cause is unknown but many cases of HSP have been observed to occur after viral infections such as a cold or flu. What are the symptoms of HSP? Palpable purpura ( red rashes which can be felt and do not disappear when pressure is applied). The rashes are often clustered around the legs (shins) and buttocks. It may appear as rashes ranging from red or purplish small dots to large patches of bruises. These rashes can be seen at times over the arms, ears and face. 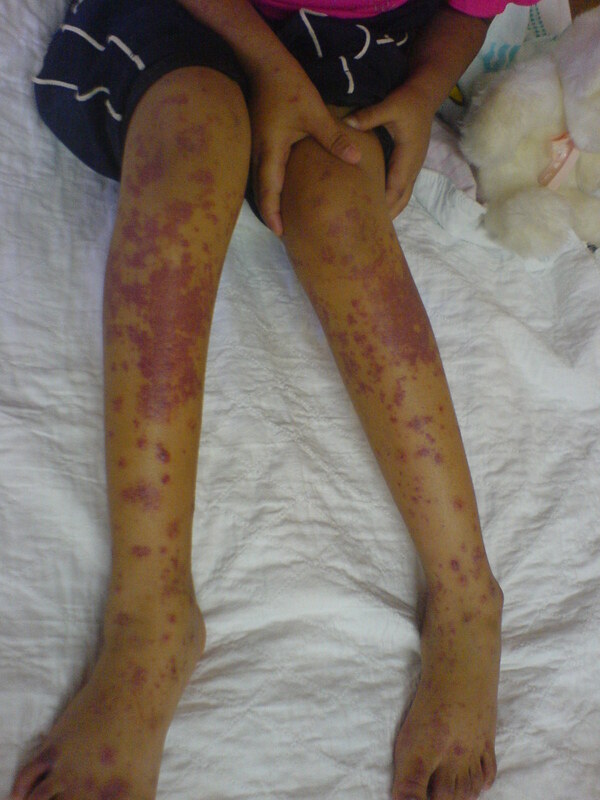 Frequently, children may develop some swelling of the tissue around the rash (subcutaneous oedema). These painful swellings can occur around hands, feet, joints and even the scrotum or scalp. Some children may experience arthritis or painful and swollen joints. The large joints are often affected. The swelling and pain often subside within 24 to 48 hours. Inflamed blood vessels in the intestine can cause cramping abdominal pain which is sometimes associated with vomiting. In very rare instances, the abnormal movements (telescoping) of the intestines due to the inflamed blood vessels within the intestines itself can cause an obstruction of the bowels (intussusception). Inflamed vessels in the kidneys often cause a painless type of bleeding into the urine (haematuria) which can only be detected microscopically. These often resolve without problems though in rare cases, these can cause kidney impairment. There is no specific treatment for HSP. However, in some cases of serious skin, intestinal or kidney manifestations, steroids can help to alleviate these symptoms. However, steroids have not been proven to prevent kidney impairment if the kidneys are involved. Anti- inflammatory medications (NSAIDs) can help to control symptoms of joint pain. These medications are however not a cure as HSP is a self-limiting disease which means it would eventually resolve by itself. In the rare event of an obstruction of the intestines (due to intussusception), surgery may be required to relieve the obstruction. HSP is not an infectious disease as it is not caused by any germs. What are the long-term complications of HSP? As mentioned, HSP is a self-limiting condition which usually gets better by itself. The majority of children recover without any long-term side-effects. Generally most children would recover by 2 to 4 weeks. However HSP can be prolonged in some cases and there are children who do get recurrent HSP episodes. The most serious long-term complication from HSP is kidney damage and therefore children with HSP will need to have regular blood pressure checks and urine tests to monitor their kidney function. Fortunately, kidney damage from HSP is uncommon.